Netflix has more competition, but investors seem to think that the streaming video market is big enough for both of them. Coinstar, the parent of Redbox, and Verizon (VZ) said Tuesday that they had reached an agreement with movie studios and device makers to "bring thousands of popular movies to consumers at home and on the go." The joint venture, called Redbox Instant, will cost $8 per month, which is what Netflix happens to charge users to watch movies and TV shows online. Verizon and Redbox first announced they were working on the service earlier this year. It will finally debut later this month. 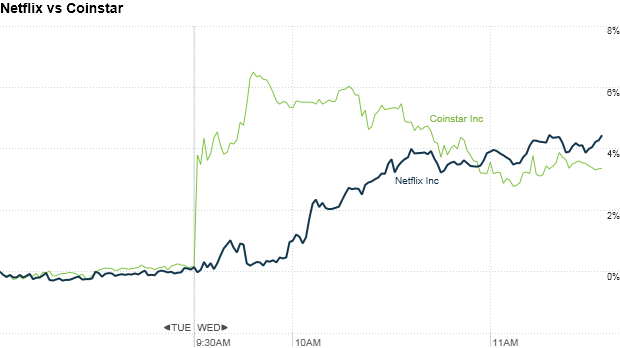 Despite the news, shares of Netflix (NFLX) rose 4% in midday trading. Coinstar (CSTR) shares were up 3%. Netflix was also getting a boost from Morgan Stanley analysts, who raised their price target on the stock to $105. The analysts said Netflix's deal with Disney (DIS) would give it an edge with studios when it was time to renew its contracts. The interesting timing was not lost on StockTwits traders. $CSTR launching its streaming svs is not positive for $NFLX, but the market doesn't seem to think so. Other factors in play here. Those other factors could include a short squeeze. It doesn't hurt to have Morgan Stanley touting Netflix's virtues. $NFLX, chugging higher on big volume. Angry and ready to bust up some shorts. Or, it could be that the chairman of the Federal Reserve is feeling generous.